Graphic By Across the Universe: from quarks to quasars. It is not enough to simply click "like" to show your interest in a FaceBook fan page. To keep a motor running, you add gasoline. To keep Facebook running, you add TEXT to the comment box. 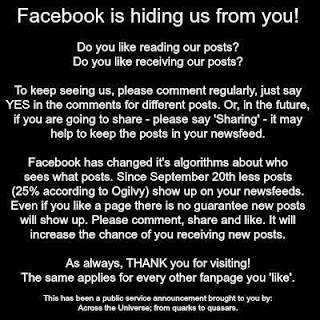 The algorithm used by EdgeRank IGNORES "like" and looks for meaningful INTERACTION by the reader. Thus, you have to TYPE AND ENTER TEXT in the comment box to keep posts updated. 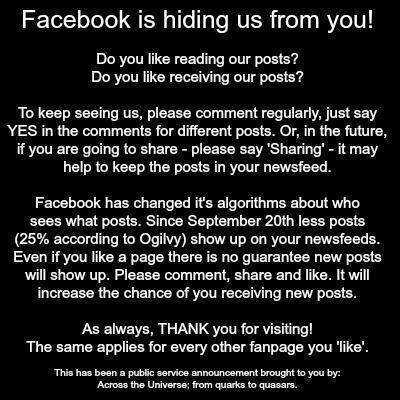 This is why your posts aren't showing up in your friends' news feed. you need to INTERACT with the page; so tap a few keys and you'll be good!